I am honored to introduce our President and the leader of the Bayonne Rotary Club Reverend Dorothy Patterson. Reverend Patterson is the Pastor of Wallace Temple located at 392 Avenue C, here in Bayonne where she has served as pastor for four years. 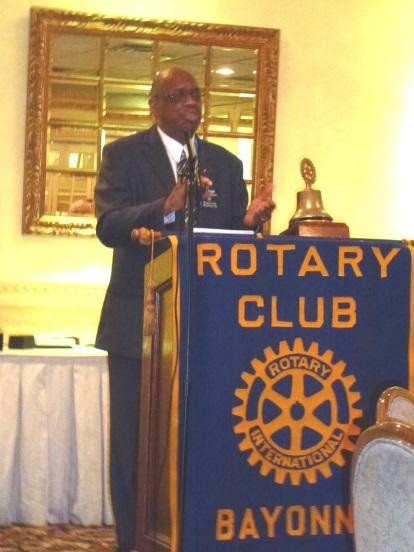 Reverend Paterson has led the Bayonne Rotary Club from June 2012 to the present and has continually exemplified the Rotary Theme of "Service above Self". • Supported RYLA (Rotary Youth Leadership Awards) Campaigns – the Club sent 5-RYLA youths from Bayonne High School and Marist – representing 10% of the total of all District 7490 participants. • Awarded a $1,000 Vocational Scholarship annually to a worthy college entry student. • Assisted Maureen Caswell in her transition to a new career and was dutifully at the Chandelier most cold and dark Tuesday mornings before 7:30am to collect the breakfast and 50/50 money, and take her gavel and bang the Rotary Bell to open and close the meetings. As she celebrates “The Passing of the Bell” to the President-Elect Chester R. Banks - Please stand and join me in celebrating the achievements of the President of the Bayonne Rotary Club Reverend Dorothy Patterson.